He was a sweet-looking babyface as long as you weren’t looking at him from the other side of the ring. Depending on the source, his nickname may include “Texas” at the end, or be reorganized as “The Sweetwater Swatter,” but in any case, Verlin E. “Lew” Jenkins was a guy that serious boxing fans are aware of for more reasons than his awesome sobriquets. His back story – beginning as a carnival fighter and working his way up to become world lightweight champion – is the stuff of legend, as were his excessive partying and wild escapades after becoming champion. There are crazy stories about him going months on end without ever going to sleep before dawn, and crashing several cars and motorcycles. But that’s only part of the Lew Jenkins story. He was also a decorated soldier, serving in WWII and the Korean War, and participating in the D-Day invasion. He was awarded the Silver Star for heroism and gallantry, and saved the lives of several men who were cut off behind enemy lines. Let’s play the celebrity lookalike game – who does Lew Jenkins resemble? 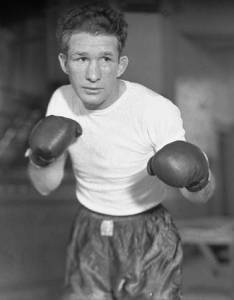 Born in Millburn, Texas (not Sweetwater), Jenkins was a deceptively powerful puncher despite his lanky frame. 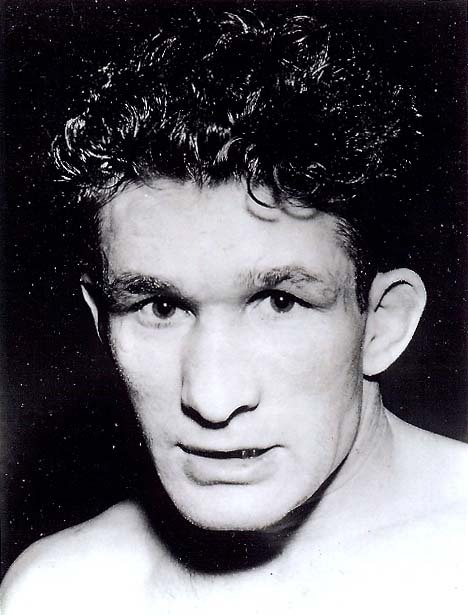 He had wins over some of boxing’s greatest names like “Sailor” Fay Coskey, Midget Mexico, and “Chief” Evening Thunder, as well as some great boxers like Tippy Larkin, Mike Belloise and Bob Montgomery. He became world champion by defeating Luigi Giuseppe D’Ambrosio (better known as Lou Ambers) and then defeating Ambers again in a rematch, after Ambers had a tune up fight against Al “Bummy” Davis. That was in 1940. However, Jenkins’ wild side caught up with him, and he lost the title to Sammy Angott in 1941, fighting with an injured neck from a motorcycle accident experienced between fights. Jenkins’ later years involved a part-time career as a journeyman fighter, along with some military service, and ultimately a move to Oakland, California, where he passed away in 1981 at age 64. But boxing fans and funny names fans will find it hard to forget Verlin E. “Lew” Jenkins, “The Sweet Swatter from Sweetwater (Texas)”. You go, Lew! This entry was posted in Uncategorized and tagged boxing, funny, history, humor, humour, military, names, sports. Bookmark the permalink. Yes, absolutely! Maybe Martinez-Cotto in NYC if they end up finalizing that date! Wow, just looked them up. Insane! $268 for the cheap seats. Wow! Arto and I saw Martinez-Chavez for $75 a seat, and those weren’t the worst seats in the house. That clip made me laugh out loud at my desk. You know I always love an Ingrid Bergman shout out! PS: There’s probably enough funny named characters in Cheers to warrant a post at some point … perhaps a joint post … by our resident BoFN Sam and Diane stand-ins … I’m just saying. Sam and Diane stand-ins… interesting thought! I’m way more interested in being Ted Danson than David Schwimmer. I can roll with that. i miss the old school boxing days, though i wasn’t alive this far back. what happened to the old guys with nicknames like ‘boom-boom baumengartner? or was that from the flintstones? Well, Ray “Boom Boom” Mancini was a popular fighter in the 80’s, so I guess it hasn’t been all that long. But I completely agree… we need more awesome old-timey boxing nicknames! I can totally see it! I was super tired when I wrote this, but I knew there was a lookalike in there somewhere! Good call!